I woke up the other morning from a dream in which Caden didn’t have autism. It was just a dream but I couldn’t stop thinking about it for some reason. Had coffee, did some laundry, and worked on some school work with Caden but I still couldn’t shake the dream. The disturbing part is that I felt like you would after a bad dream but that didn’t seem right since the dream was for all practical purposes good, right? And then I stumbled across a question on a facebook group I belong to that asked if you would eliminate or cure your child’s autism if you could. And then I started to put it all together and kind of figured out why the dream disturbed me so much. We’re lucky in that Caden doesn’t hurt himself or others deliberately, he is verbal although not always clear, and is making gains every day (BRAGGING MOMENT, he just graduated to the 5-6 year old gymnastics class at the Y and graduation was based solely on skill. The child who had trouble with steps is now walking forward, backward, and sideways by himself on the HIGH balance beam). Having said all of that, Caden can’t make eye contact, struggles with anything other than the most literal conversations, and frequently misunderstands social interactions with kids his age. He struggles with wide open spaces like parking lots, has difficulty understanding routine changes, and has more sensory challenges (like eating) than I care to mention at the moment. So would I take autism away from him? Of course, there’s no question because I want my kids to be happy and free from fear as much as they possibly can in life. I would love for him to not have to struggle with the things that other kids his age do without a second thought. But I also completely adore my son. I love the way he looks at you out of the corner of his eye (he knows everyone wants eye contact; it just isn’t something he can physically or mentally do). His sense of humor is quirky, unusual, and usually just plain funny. He has such a beautiful smile and his blue eyes simply light up when something catches his attention. He has an attention to detail that enables him to point out something to me every day that I wouldn’t have noticed, like the white butterfly in the field, the shape of the clouds, or how the color of the car next to us is just like the one on Team UmiZoomi. He doesn’t know that he is different; he is just Caden without worrying about what others think or do. He makes me really slow down and think about what I say before I say it, which I think has probably made me a better teacher. He has expanded my tolerance so that I don’t immediately think wow look at that brat. Instead, I stop and ask myself if there is something I could do to help the mother/father/grandparent/sibling trying to deal with their life at that moment. I guess what scared me about the dream is that I don’t know who Caden would be without autism. There’s no question that I would still love him with my entire heart; he’s my son. What I finally realized is that I’ve accepted autism as a part of our life. That doesn’t mean I won’t fight like hell to keep it from taking Caden away from me. I’ll never stop fighting for and with him. But I no longer always think about autism when I think about Caden. He’s back to just being my baby, my perfect adorable baby. And honestly that gives me a lot of hope for the future. This year for her birthday my daughter asked to go to her favorite sit down restaurant with a few of her friends. We were allowed to tag along (you know to pay the bill and handle any problems) but we had to sit at another table. I have to admit I was a little heartbroken because I’ve enjoyed planning theme parties for the last 10 years and the fact she is growing up so quickly is a little hard to handle. She picked her restaurant and after a lot of phone tag she arranged with 3 of her friends a time and date to go to Applebees. I woke up today though with a sick knot in my stomach. Interestingly it wasn’t over the fact my baby girl is growing up (heck it’s an early birthday party so she’s technically 10 for a few weeks longer), but the fact that we would be taking Caden to a sit down restaurant on a Sunday afternoon. So many possible problems here: 1) the girls want to sit at a table by themselves; he adores his sister and her friends and inevitably will want to sit with them 2) it’s a sit down restaurant requiring a sit down meal; we don’t even eat in at McDonalds because Caden likes to eat and run 3) we are going on a Sunday late afternoon and I’m willing to bet there will be (gulp) other people in the restaurant. All in all this is just an autism recipe for disaster. Let me be perfectly clear, I know how difficult public life and interactions are for Caden and I know how hard he works every day. I can’t and won’t ever be embarrassed by him or his behaviors. However, I also remember (vaguely) what it is like to be a kid and not want to be embarrassed by your family. Ryley and her friends are awesome with Caden, but at the same time I’m sure Ryley gets tired of hearing “don’t forget you are modeling appropriate behavior for Caden,” and “you know he can’t help it, it is an autism moment.” This is her birthday request--she doesn’t deserve to share her moment with autism. I think we often remember how hard it is as parents to manage autism, and I know we remember how hard it is for Caden every day. We are never at a loss for compliments for him because we want him to know that we understand how hard he is working. Unfortunately, I think we all forget sometimes how hard it is to be the neurotypical sibling of someone with autism. Yeah, I know she’s learning compassion and tolerance, but it’s not fair that she has to live that lesson 24/7. Fast forward. The friends have been returned home and both kids are asleep. The meal turned out really well although the girls did temporarily forget they were big kids now and asked me to help them figure out menus (YAY MOMMY IS STILL NEEDED). They sat at a booth beside us and while Caden initially got upset over not being able to stay with the girls, he kept himself amused with my Ipod touch. The girls sang happy birthday to Ryley and embarrassed the heck out of her. If she thought that was embarrassing, it is a good thing she didn’t hear her brother say Hey I’ve got to poopsie really quick! 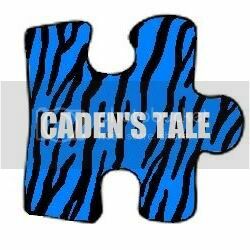 We have a new autism awareness page on Facebook: Caden's Autism Heroes. Please "like" us on facebook and share with others. It’s all about the poo these days. I’m not even talking metaphorically about our state’s shutdown or the pay cuts that will show up on our first fall pay check, or even the price of gas. I’m talking about good ole fashion poo or poopsy as my son calls it. Caden has been tinkle trained for almost 2 years; honestly he was perfectly trained in one day. #2 training has been a whole lot more challenging though. We own just about every expert’s book on the subject. We have children’s books that flush. We’ve watched Elmo talk about the potty. We’ve tried begging and even a little bribery starting with matchbox cars all the way up to new wii games. The pediatrician use to offer advice until she realized that everything she suggested we had already tried. Eventually she just started avoiding the subject as did most of our therapists. A student teacher tried embarrassment (Oh Caden don’t you want to be a big boy?). He desperately did want to be a big boy but the potty was too scary so he held it until he was severely constipated. It took over a year for his insides to heal from that episode so we designed a system that would let him be a big boy while accommodating his fear. He wore underwear throughout the day until he needed to go #2. Then he would get us a diaper and we’d put it on him. He’d come back with wipes when the deed was done. It worked for us and thankfully his preschool teacher was willing to accommodate the unusual request as well. Of course family and friends didn’t hesitate to point out that if “he was old enough to get the diaper and wipes, he was old enough to use the toilet.” Family, friends, parenting advice, and autism is a whole other subject for another day. But about 3 weeks ago, Caden and his dad started talking about him outgrowing diapers (a suggestion that another asd parent suggested) every night at bedtime. He eventually decided he could try the potty and thankfully had success. In the name of disclosure he doesn’t use the usual method; he lifts ALL of the toilet seats up and sits on the bowl. Well sits is a little inaccurate. He holds himself over the bowl with his arms but I must admit his balance is absolutely amazing although I am waiting for the fall in incident. This success and I must brag for a moment and say that he hasn’t had a single accident, has come with a total fascination of poopsy. It’s a fascination that we are totally and completely encouraging. He’s talking in terms of past (what went in the bowl that morning) and future (what he might accomplish tomorrow). He’s using descriptive and comparative language (size is a frequent topic) and he’s counting (yes he is keeping track of how many poopsies have gone in the potty). He’s also using creative imagery which is something that he has always scored horrifically low on when he takes development tests….wait for it. Yep, every success is explained in terms of what shape he thinks it looks like. This morning he was convinced that the poopsy was shaped like a butterfly. And have I mentioned that he is also practicing expressive language; this morning’s success was met with a “oh my goodness mommy look at that” complete with perfect intonation and pitch. It’s not that we really enjoy talking about poopsy morning, noon, and night but we LOVE the conversations with our son. CONVERSATIONS people, real interactive conversations. Now many of you know that I messed up a few months ago by pointing out a Seeing Eye dog to Caden. I temporarily forgot the literal nature of autism and consequently Caden has been convinced that he doesn’t need nor does he want a service dog because he can see just fine. I’ve been a little worried about this one because he gets quite upset when the service dog is mentioned. But tonight, I pointed out to him that the service dog will go poopsy and he was absolutely fascinated. I’m calling it a big ole butterfly shaped success! In case you are obsessing with us, we leave for service dog training 2 weeks from Tuesday….gulp.